Added by Alana Marie Burke on May 30, 2014. Endurance GB (EGB) has suffered its 2nd high-profile departure in 7 months with Karen Collier’s resignation as chairman. The announcement came just days after H&H revealed the British Equestrian Federation (BEF) was negotiating with Saeed Al Tayer, chief executive of Sheikh Mohammed’s Meydan corporation, about its renewed investment in the UK, prior to having demonstrated improvements in the conduct of the Middle Eastern sport that provoked last year’s scandals. Horse sport’s governing body has defended the inclusion of an exceptionally thin horse in the 160CEI at Compiègne, France, last week (23 May). A photograph of the horse — described as “disturbing” by a leading equine welfare charity — was widely circulated on social media. The FEI has not confirmed the horse’s identity, but it is understood to represent one of the Middle Eastern teams based in Europe for the summer. The main outcry centred on a Facebook group for endurance specialists, who are familiar with the sport’s tough demands, but were “horrified” and “ashamed” by the horse’s appearance at the initial inspection. Fundraising to get New Zealand’s endurance team to the Alltech FEI World Equestrian Games has started in earnest, with a seminar in Christchurch among the first of several events around the country. The International Equestrian Federation is under increasing pressure to tighten its rules on endurance racing after controversial images emerged of a “skeletal” horse competing in a 100-mile race in France. Vets have described the picture of Shakla’s Sudden Impact, from Bahrain, as “disgusting” while a leading horse welfare group called for a more rigorous enforcement of safety rules. Shakla’s Sudden Impact was passed fit to race at Compiègne by the same judges who will officiate at the World Equestrian Games (WEG) in Normandy in August. There’s yet more disturbing news coming out of the world of International Endurance. On May 23, an emaciated horse was passed fit to compete at the initial vet check. ROYAL ENDURANCE TEAM of BAHRAIN. This photo understandably began to go viral across the internet, including into the inbox of the President of Compiegne endurance, Christian Depuille. Paris, May 25 (BNA)-- Captain of Bahrain's Royal Endurance Team Shaikh Nasser bin Hamad Al Khalifa praised the high performance of Bahraini horse riders in the 120-km held in Compiegne near Paris, in France. Nine Bahraini riders were among 144 contestants in the fray. Shaikh Nasser said he was proud for the brilliant performance of his riders during the races in Compiegne. He pointed out that the team's participation in Compiegne championship followed their outstanding success in Windsor race, in Britain. He described the 160-km and 120-km races as very enriching, emphasising their significance for future international competitions. Shaikh Nasser noted the fierceness of this event in all its stages with some of the world's best riders in the fray, which added more excitement to the competition. The Royal Team leader also congratulated riders from the UAE and other Arab countries which took part yesterday, and commended the efforts of their respective equestrian federations in the overall development of this traditional sport in the region. He pointed out that he did not want to participate in the 120-km race to allow the Bahraini riders to benefit from the presence of the high number of competitors from all over the world and boost their self-reliance in such competitions. The Royal Team Captain met the UAE Vice President, Prime Minister and Dubai Ruler Shaikh Mohammed bin Rashid Al Maktoum and Dubai Crown Prince Shaikh Hamdan bin Mohammed bin Rashid Al Maktoum and congratulated them on the leading places clinched by the Emirati riders. Compiegne, France: Abdullah Ganem Al Merri on Quran El Ulm came up with a superb finish to win the HH Shaikh Mansour Bin Zayed Al Nahyan Global Arabian Horse Flat Racing Festival-sponsored Festival Mondial d’Endurance HH Shaikha Fatima Bint Mubarak Ladies Cup ride in Compiegne, France, yesterday. Completing a one-two triumph for the UAE was Shaikh Abdullah Bin Faisal Al Qasimi on Laiza De Jalima, while French duo Marine Saignie on Qrafiq La Majorie and Ludovic Saroul on Magdan Solal were third and fourth. Another UAE rider, Ahmad Dahi Salem Al Muhairbi on Talik Ben Melfik, was fifth. 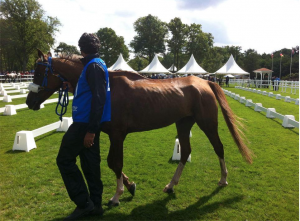 Dubai: Over 200 riders from 32 countries will vie for top honours in the 2014 edition of the Festival Mondial d’Endurance in Compiegne, France sponsored by the HH Shaikh Mansour Bin Zayed Al Nahyan Global Arabian Horse Flat Racing Festival. The overwhelming number of entries received for the event’s two feature rides ensures that it even surpasses the European Championship in terms of international participation. A strong contingent representing the UAE will be seen in action in the 160-km CEI-O Three Star ride on Friday. The squad is led by Shaikh Rashid Dalmook Al Maktoum, Shaikh Hasher Bin Mohammad Thani Al Maktoum and Shaikh Hamed Dalmook Al Maktoum. This ride, which will act as a qualifier for the World Equestrian Games to be held in Normandy in France from July 28, will be held over five stages of 39.4 kilometres, 36 kilometres, 34.4 kilometres, 30.3 kilometres and 20.1 kilometres each. On Sunday, over 125 of the best lady riders will compete for the HH Shaikha Fatima Bint Mubarak Ladies Cup over 120km. The event will also see classifications to decide the overall winners as well as the Nations Cup team toppers. “We are delighted to be back here again and we thank His Highness Shaikh Mansour Bin Zayed Al Nahyan, UAE’s Deputy Prime Minister and Minister of Presidential Affairs and Her Highness Shaikha Fatima Bint Mubarak, Chairwoman of the General Women’s Union, Supreme President of the Family Development Foundation [FDF] and Head of the Supreme Council for Motherhood and Childhood for their support,” said Lara Sawaya, Director of the Shaikh Mansour Festival and Chairman of Ladies Racing at the International Federation of Arabian Horse Racing Authorities (IFAHR). “It is a very busy period for the HH Shaikh Mansour Bin Zayed Al Nahyan Global Arabian Horse Flat Racing Festival over the next fortnight. “After the endurance rides here in France, the Festival will unveil the 5th edition of the World Arabian Racing Conference in London. The HH Shaikh Mansour Bin Zayed Al Nahyan Global Arabian Horse Flat Racing Festival is organised by the Abu Dhabi Tourism and Culture Authority and coordinated by Abu Dhabi Sports Council in association with Emirates Racing Authority, IFAHR and Emirates Arabian Horse Society. It is supported by the Ministry of Foreign Affairs, the General Authority of Youth and Sports Welfare with Arabtec Holding PJSC as the official partner and Emirates airline as the official carriers and sponsored by Invest AD, Tourism Development & Investment Company (TDIC), Al Rashid Investment, Al Awani General Enterprises, Kabale, Al Wathba Centre, the UAE’s General Women’s Union, the HH Shaikha Fatima Bint Mubarak Ladies Sports Academy, Abu Dhabi International Hunting and Equestrian Exhibition 2014, Dr. Nader Saab Switzerland, Al Wathba Centre, Abu Dhabi Equestrian Club, Eastern Mangroves Suites-Abu Dhabi by Jannah, Abu Dhabi Sports Channel and Racing Post. May 21, 2014 -- The United States Equestrian Federation (USEF) has named 16 endurance horse-and-athlete combinations to the Long List for 2014 Alltech FEI World Equestrian Games. All combinations will be required to demonstrate continued preparation, soundness, and ability by attending one Fitness and Soundness Assessment. More information about these assessments will be available on USEF.org as it becomes available. Synthetic is a 2000 Arabian gelding. Frisia Shaheen is a 2006 Arabian gelding. SH Sur Trad is a 2004 Arabian gelding. Just Gold is a 2005 Arabian gelding. FYF Dutch is a 2004 Arabian gelding. Hot Desert Knight is a 2000 Arabian gelding. Wallace Hill Shade is a 2002 Half-Arabian gelding. Indepen is a 2002 Arabian stallion. Chanses is a 2005 Arabian gelding. RR Gold Dust Rising is a 2006 Arabian gelding. My Wild Irish Gold is a 2003 Anglo Arab mare. Syrocco Cadence is a 2003 Arabian mare. Syrocco Reveille is a 2000 Arabian mare. The Selection Procedures for the 2014 Alltech FEI World Equestrian Games U.S. Endurance Team can be found here: https://www.usef.org/_IFrames/breedsDisciplines/discipline/allendurance/hpendurance.aspx. Follow the U.S. Endurance Team here. Susie Latta does not have to look hard for inspiration to help her endure a sport which takes up more than nine hours at a time. Latta (44) has been selected in the New Zealand endurance riding team to compete at the World Equestrian Games in France in August. The Nenthorn Valley farmer will make her international debut. 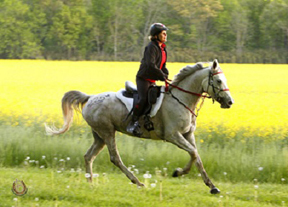 Riders are required to cover a 160km course on one horse. Latta is the mother of the late Dion Latta, a 15-year-old schoolboy who died after being trapped in a waterfall near Wanaka in early 2012. Alison Higgins almost gave up riding after losing the horse she took to the 2010 Alltech FEI World Equestrian Games in Kentucky. But the 45-year-old sheep and beef farmer from Nelson, who also breeds horses, is back in the saddle and has been selected in the New Zealand endurance team to compete at the 2014 edition in France. Higgins lost her horse Twynham El Omar at the 2013 national championships. "I would have loved to take him to another WEG," said Higgins. "When I lost him I didn't think I would ever sit on another horse again." It took her four months to get back into riding, and she struggled in many ways. May 19, 2014, California ~ On April 20, USA Endurance hopefuls gathered at Broxton Bridge Plantation in Ehrhardt, South Carolina, to take part in the 2014 Alltech FEI World Equestrian Games Endurance Team Selection Trial CEI2* 120km. The race was scheduled to take place April 19, but heavy downpours caused the race to be rescheduled to April 20 and run under a new format. Under the guidance of Chef d’Equipe Emmett Ross, 14 applicants for the Alltech FEI World Equestrian Games plus an additional three proxy riders riding in two groups headed out onto the three-loop trail which totaled 69.44km. Riders had to maintain a specified speed, use their GPS units, and work together as instructed. On April 21, all horses completed a post-event veterinary inspection. It is definitely going to be one of the winning cards of the great international event dedicated to horses, 10 to 27th July. The race track, which was carefully examined by the organizing Committee of Italia Endurance Festival, the European Juniores and Young riders and the CEIO, has all the characteristics to be the ideal host of the endurance sporting discipline. 120 km stretching across a vast country side which follows gently the natural course of the river Adige from north to south, from San Martino Buon Albergo to Albarello, across San Giovanni Lupatoto, Zevio, Belfiore and Ronco all’Adige. The race track is made up of three loops: the 38 km Yellow Loop, the 27 km Red one and the 19,5 km the Blue Loop to be repeated both during the European and CEIO2* races in the following order: yellow, yellow, red and blue. A yellow loop less in the 90 km CEI1*. On the background, as we already mentioned, there is the beautiful fluvial landscape which preserved its uncontaminated integrity over the centuries, an exciting and varied environment immersed in the natural oasis of Pontoncello Park, with paths shadowed by towering black poplars and elegant weeping willows immersed in the magical silence of the landscape. Horses and riders blend in perfect harmony with these ideal surroundings, in which the relationship between man and horse reaches its utmost expression. The silence is interrupted only by the sounds of nature and by an extremely rich fauna living in the Park: from the birds’ chirping to the croaking of frogs, from the leaping of a hare to the elusive look of a fox. Participants will be amazed at the beauty and uniqueness of the Italia Festival track. Seeing is the best proof. There’s history in the naming of the New Zealand endurance team to compete at the Alltech FEI World Equestrian Games 2014 in France. With less than 100 days to go until the championship event, Equestrian Sports New Zealand has announced its endurance team, which includes mother and daughter Andrea and Georgia Smith. The Mangaweka duo are the first such combination to represent the sport at an equestrian championship together, and Georgia is believed to be the youngest ever. Joining them are Alison Higgins (Nelson), who makes her second WEG team, Braden Cameron (Wellington) and Susie Latta (Otago). New Zealand will also have eventing and vaulting teams at WEG, with the possibility of showjumping and para-equestrian representatives too. ESNZ high performance director Sarah Harris and the endurance team’s chef d’Equipe Tony Parsons are very excited by the prospect of their five-strong team. The best three scores count for the team tally. It’s been a tricky run for the endurance riders. The national championships were cancelled at Easter due to dreadful weather, and a final selection run at Taupo was arranged for three weeks later. That meant some riders just missed out, unable to juggle other commitments and keep their horses in work. But one of the biggest hurdles for the riders has not been making the team. Rather it will be in the required fund-raising to get their horses to France, and hopefully back. Each rider needs to raise around $60,000 – but some have already said they will probably have to sell their horses in Europe. For Sarah Harris, the strength of the team is an indicator of how far the endurance programme has come in the last two years. “Two years ago we only had one combination qualified for the Endurance World Champs, so we are thrilled to have the ability to send a team like this to France,” she says. To celebrate the 100 days to go until WEG, artist Christophe Dumont, with more than 20 others, created sand art featuring giant horseshoes in the Bay of Mont-Saint-Michel. The endurance event will pass through this bay. Brothers-in-law Sheikh Nasser Bin Hamad Al Khalifa of Bahrain and Sheikh Hamdan Bin Mohammed Al Maktoum of The United Arab Emirates shared victory in the Royal Windsor Endurance 120km CEI** competition yesterday. Under the rules of Endurance GB, to be able to enter the top level rides or international rides, horses and riders must be at Advanced Level. To qualify for this both horse and rider must have successfully completed an 80km (50 mile) ride in one day at an average speed of over 10kph. At this year’s Blue Chip St Meubred’s ride, Nicky Martin from Kingsbridge, riding Rocheros Qasbah, a seven-year-old gelding, successfully achieved this. For the first two circuits she was riding with Carina Kane on Evermore Artistic but for the last ten miles Nicky and Qasbah were out on their own. London, May14 (BNA)The 71st edition of the Royal Windsor Horse Show opened today in London. Bahrain is taking part in the prestigious equestrian extravaganza, being held in the private grounds of Windsor Castle in London. Scheduled to conclude on May 18, the four-day event is playing host to International Jumping, Driving, Dressage and Endurance Competitions. The endurance competition made its debut at Royal Windsor Horse Show when it was first introduced last year by Bahrain Royal team, led by Shaikh Nasser bin Hamad Al-Khalifa. Bahraini riders are taking part in the endurance and showjumping competitions, along with contenders from the United Arab Emirates, the Sultanate of Oman, Britain and other European countries. Supreme Council for Youth and Sport (SCYS) Chairman and Bahrain Olympic Committee (BOC) President Shaikh Nasser bin Hamad Al-Khalifa stressed the importance of Bahrain's participation in the festival which was first launched 71 years ago. His Majesty King Hamad bin Isa Al-Khalifa and Her Majesty Queen Elizabeth II of the United Kingdom of Great Britain and Northern Ireland attended last year's event. "The participation in Royal Windsor Horse Show reflects deep-rooted historic relations as Bahrain and Britain celebrate the bicentennial of their bilateral ties", he said, paying tribute to HM King Hamad for supporting Bahraini knights. Led by Shaikh Nasser bin Hamad Al-Khalifa, the Bahrain Royal team includes Shaikh Isa bin Salman bin Mohammed Al-Khalifa, Khalid Al-Khateri, Basel Al-Dosery and Ahmed Mansour, who are scheduled to make their debut tomorrow. ENDURANCE riders are the marathon runners of the equestrian world. They battle all weather conditions for hours on end and say that competing in the 80 kilometre or 160 kilometre events is addictive. However, unlike a marathon, endurance riders are not in these challenges alone. Wild About Hooves owners Jen Clingly and Jeremy Ford agreed the comradeship built with your horse is what makes the sport popular. "Definitely for us that partnership that you develop with your horse is so important in endurance because you develop that skill to be able to listen to them, so if they're struggling or on track or if the weather conditions are impacting on their physical abilities," Ms Clingly said. 2014 WEG: The Games’ programme of festivities is finally unveiled! The 183 hours of competition will not be the only entertainment provided during the fortnight of the Games. In addition, the Games Village, which will be at the heart of the event, will offer a varied programme of top-quality festivities and entertainment ! More than 150 hours of entertainment planned! On Saturday May 10 three international tests in Bàscara Raid (Gerona), were attended by 62 pairs from Spain , United Arab Emirates, France, Belgium and Italy. The CEI** and CEI*** races were dominated by pairs of Juma's Team, with victories by Maria Alvarez on RAMSES-DE-LA-ROTJA in the 160 kilometer race, and Gil Berenguer with NINA-BIN-MENFIS in the 120 kilometer race. The participants in the CEI*** rolled together for the first three phases. In the fourth phase differences occurred and in the final phase, María Álvarez ,and RAMSES-DE-LA-ROTJA and Nuria Serrabassa with NOVISAAD-D'AQUI , went first and took the top two spots with no problems. The first phase of the CEI** ran more than 21 km / h average speed, with a lead group of ten pairs, of which only four reached the final goal, all of Juma 's Team. The winner was Gil Berenguer riding NINA-BIN-MENFIS ahead of Mireia Clua riding SOULETOULE-DE-SOMMANT, Sandra Dachs riding TSUNAMI-BIN, and Angel Soy riding SUPER- SANG. The most contested race of the day was definitely the CEI* where Goyo Núñez de Arenas riding ANWAR-RAINA set the pace in the lead from the first phase, accompanied by Mohd Balarti riding TRA-IRKUT, and Dani Marfa riding MIDNIGHT MIRAGE. In the second phase were left only Marfa and Núñez de Arenas, and in the final phase Gregorio Núñez de Arenas and ANWAR-RAINA, and alone in the lead, dominated the race and finished the winners. Even as the 160-km Italian Championships at Golvant were underway on May 9th, the race was suspended because of poorly marked trails and missing signage. More than 30 riders were lost out on trails between the first and second phases. Aside from a few who were able to find and follow the trails, most of the others, lost in the forest, threw in the towel and returned back to the vet gate. The event was noted by one Italian reporter as the most 'miserable' event in the history of Italian endurance. An urgent meeting was held between race judges and the Italian coach, where it was decided the Italian Championships would be cancelled, and any riders wishing to try to qualify and rank for the August WEG could continue to ride a distance of 160-km. A loop was selected, which would have to be ridden 3 more times with the required vet stops. Eight riders chose to continue riding the rest of the 160 kilometers, while the other riders left, with the promise of rescheduling the Italian Championship on May 31 in Castiglione del Lago. Entry fees were refunded to the riders. The next day a CEI** and CEIJYR** and CEI* were held (repeating 2 loops to get the mileage) and all went smoothly, with a motorcycle and two cars on the course to make sure markings were not removed. The culprits of the sabotaged trail markings are not known, but it was noted that a mountain biking race with hundreds of participants not far from the endurance race had no problems with their trails. it is thought that better relations between ride management and locals - not just political leaders of the territory - could forestall such further incidents. The 29th edition of the Rambouillet ride, known as the Raid Al Shaqab Yvelines Cup, took place on May 2 and 3 in Rambouillet, France. 152 riders took to the trails for the races, which included a CEI***, two CIS*, CEI**, CEIYR**, and CIS*. 20 of 44 riders completed the CEI*** 160-km, with France's Emilie Lambert riding Ekstrem Black Font coming in first in 9:04.21. In second place by one second, was France's Sandrine Lance riding Samba Island, and third was France's Tiphaine Leon riding Natifao Bozouls, in 9:05.02. Except for ground which had suffered heavy rains the day before the CEI***, and an unexpected traffic jam in the village of Sonchamp during an assistance point, the races were conducted in the best possible conditions - climatic and organizational. Riders and audience enjoyed both dinners and a final concert by the rock band The Luciolles, offered by Enduro Horse Association, who teamed up with Al Shaqab and Rambouillet to put on the ride. Antrim Grammar School pupil Morgan Skillen has come third in the recent St Patrick’s Coast Endurance Ride. The Year 10 pupil, who was representing both her school and Mid Antrim Pony Club at the event, has now qualiied to go to the UK championships in England to represent Ulster. She will go forward to represent the Ulster Region in Cholmondeley Castle in Cheshire on August 15–18. This is the first time that any competitors have succeeded in reaching the Champsionships from NI and the first time that any schools have taken part. Morgan took part in her first Pleasure Ride with the Irish Long Distance Riding Association in September 2012 at Shane’s Castle Antrim and was smitten immediately. Wendy MacCoubrey of Ste Justine De Newton, QC made history this past weekend when she became first Canadian ever to win the 160 km race at the 2014 CEI3* FEI Biltmore Challenge, held in Asheveille, NC, from May 3-4. Paired with Valerie Kanavy’s eight-year-old Arabian mare, Raven About Gold, MacCoubrey completed the 160 km race on the grounds of George Vanderbilt’s historic Biltmore Estate in a time of 12 hours for the FEI win and tied first for the American Endurance Ride Conference (AERC). The 2014 Biltmore Challenge marked the 21st event along the challenging French Broad River, over rolling hills and low mountains testing the skills of both horse and rider. Homewood farm welcomed its first endurance event which saw over 85 people and horses compete. A preview of what's to come when France hosts the 2014 World Equestrian Games. On June 6, 1944, American, Australian, Canadian, and British forces surprised German troops as they debarked on the English Channel’s French shores, storming the Normandy beaches in one of the bloodiest battles in modern times. Seventy years later, America, Australia, England, Germany, France, and dozens of other nations will join together Aug. 23 to Sept. 7 in peaceful sportsmanship along these same beaches as they compete in a sport that epitomizes unity and partnership: equestrianism. The Alltech FEI World Equestrian Games (WEG) will open in the rich and fertile French region of Normandy—celebrated for its fine cheeses, landscapes, and horses—famous for the invasion that marked the beginning of the end of World War II in Europe. In a letter released May 5th, 2014, Pierre Genecand of Switzerland confirmed his candidacy for FEI President. He originally announced his bid on February 17th, when it was officially registered by the FEI. Genecand will run against Princess Haya, who will be running for an unprecedented third term of 4 years, after all but 3 member nations opposed changing the statute on April 29th to allow Haya to run again. In less than 4 months, the Alltech FEI World Equestrian Games 2014 will kick off in Normandy. As part of this event, several national and international celebrities – actors, presenters, impersonators, former professional riders, etc. – have joined forces with the Organising Committee to lend their support to the Games: they make up our Ambassadors’ Committee. Some have been horse-lovers since their childhood, others started riding more recently, and a few simply wanted to promote their home region, but one thing they all have in common is that they are proud to use their image, their talent and their motivation to promote the Games. 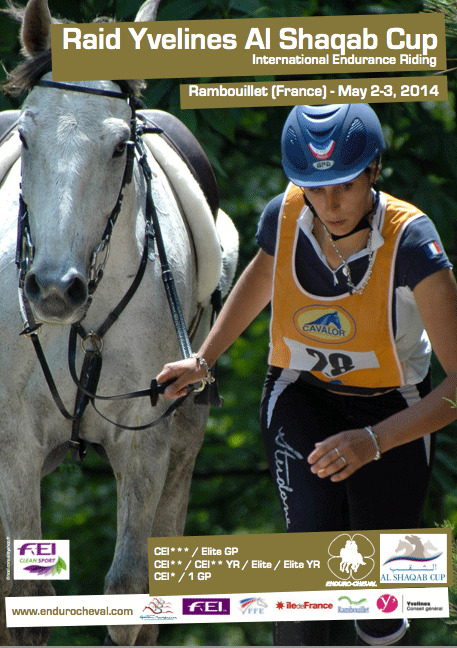 They all share the same ambitions as us: to make the Normandy 2014 edition an event to remember in France’s number one equestrian region. Jairo Rodriguez and Lyrical Breeze are Spain's new National Champions after winning the 160-km Championship at Bascara on May 3rd, in a time of 8:12.58. Former World Champion Maria Alvarez Ponton finished second on Qualif du Poncelet in 8:13.01, followed by third place Jordi Arboix riding Mystair des Aubus in 8:31.15. Ten of 39 riders completed the course. It is a repeat National Championship win for Rodriguez and Lyrical Breeze, who won last year's Spanish Championship at Sant Feliu Saserra in May 2013. No less than 72 National Federations (NFs) have declared their intention to participate in the Alltech FEI World Equestrian Games™ 2014 in Normandy, meeting the 31 March deadline for entries in principle. The number is an all-time high and represents a 10% increase compared to the entries in principle for any of the previous editions of the FEI World Equestrian Games™. April 17, 2014, SUI ~ For the first time in the 93-year history of the Fédération Equestre Internationale (FEI), the athletes themselves have the opportunity to vote for their FEI Athlete Representatives. A total of 26 candidates from 10 nations are standing for election as FEI Athlete Representatives on the FEI Technical Committees for Jumping, Dressage, Para-Equestrian, Eventing, Driving, Endurance, Vaulting and Reining. Yesterday the Fédération Equestre Internationale (FEI) announced bold steps designed to improve endurance horse welfare, proposing unprecedented athlete penalties for equine injuries, extended rest periods, and increased accountability. The moves were fully supported by delegates attending the endurance round table on the second day of the FEI Sports Forum in Lausanne, Switzerland. “The welfare of the horse is not just a veterinary issue, it’s an issue for all those who work in the sport,” said John McEwen, FEI first vice president and chair of the FEI Veterinary Committee. Proposed rule changes relating to officials’ accountability and responsibility, increased protection of horses through athlete penalty points and extended rest periods, appointment of independent governance advisors, and improved conflict of interest regulations received wide support from attendees. There was also wide support for the new FEI Endurance Codex, which the endurance committee has produced to cover endurance officials, and separately endurance athletes and registered trainers. The codex—which defines responsibility, accountability, and sanctions for those in breach of the rules—already exists for FEI veterinarians. The rule changes will be circulated to national federations for final review prior to going before the FEI bureau at its in-person meeting on June 9-10 for approval and immediate implementation. During the debate session that followed, there was a call for information about injuries at national events to be included in the Global Endurance Injuries Study (GEIS); this was backed by Tim Parkin, BSc, BVSc, PhD, DECVPH, MRCVS, whom the FEI commissioned to set up the study. Andrew Finding, chair of the Endurance Strategic Planning Group (ESPG)—which was tasked with producing a long-term plan for the discipline—expressed his appreciation for the support of the group’s recommendations. Brian Sheahan, chair of the endurance committee, added, “To protect the welfare of the horse, we need to know that we’re doing the right thing. I would like to see increased completion rates, reduced injuries and illness in the horse, and better course design.